At Campsite Madrid Arco Iris in Villaviciosa de Odón (Madrid) camping costs as little as €20,- per night during low season with CampingCard ACSI. At one of the 142 touring pitches you will get a discounted rate during the period 20-01-2019 - 13-04-2019, 22-04-2019 - 30-04-2019, 06-05-2019 - 14-06-2019 and 08-09-2019 - 05-12-2019. At this campsite you can not only use your CampingCard ACSI for inexpensive camping, you can also use your ACSI Club ID (as an alternative ID). A deceptively small campsite. Easy to find using the Madrid ring road. Ideal for a visit to Madrid (go to Boadilla by car, free parking, then by metro to the centre). Or go by car to Villaviciosa then take the bus. Very good restaurant. Nice site, spoiled by the wrong GPS coordinates in the ACSI guide so serious problems finding it. In November no food and no sports facilities and poor wi-fi so I felt it poor value for that price. A very convenient site for the city with a good bus service from just outside which is probably the only good thing about the site. The swimming pool, shop & restaurant were all shut. If you wanted a meal (which was very expensive for what it was & not very good) you had to eat in the cafe. The young waiter was excellent. Fabulous location and great restaurant. The shower and toilet facilities really do let this great site down. I’m convinced the reason why they are so clean (showers) is that no one can use them!!! They have this magic eye system that operates the shower when you are in and stops when you move out, well the new shower dance to try and secure hot water would not have been a pleasant sight. In addition to the poor showers the roads around the site and roads between pitches are very narrow and if you have a unit more than 7.5 then you will need to be very careful, it’s made worse by the site having just installed new kerbs which are very high and will damage caravan skirts and low profile MH’s apart from these comments location and getting into Madrid was fabulous- don’t be put off by 2 buses they are frequent and excellent value. Very easy and convenient to find off the main road (M501) Large elongated site with most touring pitches at the far end which is good as quieter and away from the regular, long term caravans and Spanish families making it busy and noisy on the weekends lower down. Upper pitches are well marked and spacious and airy with wooden shade shelters and trees giving more shade. Very little road noise at upper end. Drive to the next town, Villaviciosa de Odon, ten minutes away, for the bus into Madrid (you can get a bus directly from the campsite to this town then take the second bus into Madrid but advised unreliable...) Would definitely recommend if wishing to visit Madrid. Delighted with this campsite as we had friends flying into Madrid to join us for a week of sightseeing. The location is excellent with easy travelling into Madrid on the metro line. Victoria on reception was friendly and helpful, as were the other 2 chaps. We were on Pitch 69..just below Shower/toilet block WC2. a pitch which was level and large enough for our 8.5m motorhome with electric and water close to each pitch. The showers had lots of hot water...motion sensor controlled! There are a number of permanently sited caravans which were only used at the weekend by Spanish so not noisy.There seems to be a lot of work being done maintaining the site...new kerbing, relaying path to pool etc.It looks like some larger plots have been added too. The pitches at the top have a private toilet/shower but weren't large enough or convenient enough with 4 of us in the van.We ate at the restaurant a few times..either a snack of delicious steak baguette or lovely seafood paella. The shop was closed but you only need to ask at the bar for any supplies..ie bread.beer . We felt that the site was perfect for visiting Avila, Toledo, Aranjuez and even to Cuenca as our friends had a hire car.Would happily recommend this site and wouldn't hesitate to stay again. Excellent site with large level pitches which were great for our 8.5m motorhome. We had pitch 69 just near the WC2 block. Good clean facilities, plenty of hot water with showers on motion sensor. As had friends flying into Madrid and staying with us we had the use of their hire car to visit Avila, Aranjuez El Estorial Toledo Cuenca and Madrid using the metro from Boadilla del Monte. ..ate in the restaurant a few times and enjoyed their paella and steak buns.Lovely staff on reception Victoria. .and Juan Carlos in the cafe. Shop closed but can get stuff from it via the bar. Lot of improvement work going on and it seems a well managed site. Would happily recommend and use again.Not the most picturesque site but good facilities and location. The campsite is located very close to the motorway but the campsites shape is long and with the caravan pitches being at the back of the site you get very little noise from the road. The pitches themselves are large enough for a 7m caravan, awning and car. The Owners are clearly spending money improving the site, with new shower and toilet facilities. If we were in Madrid again I'd stay here. It is a great camping for the whole family. We liked it so much and we recommend it to anyone travelling with kids under 12 years old. Would you like to book Campsite Madrid Arco Iris or request more information? You can do both using the information below or by visiting the campsite's website. Take exit 36 on the M40 ring road around Madrid. Take M501 dir. Boadilla. Then dir. Villaviciosa, take exit 7. The campsite is located on the right. Coming on the M50, exit 69, M501 dir. Villaviciosa. Exit 7. 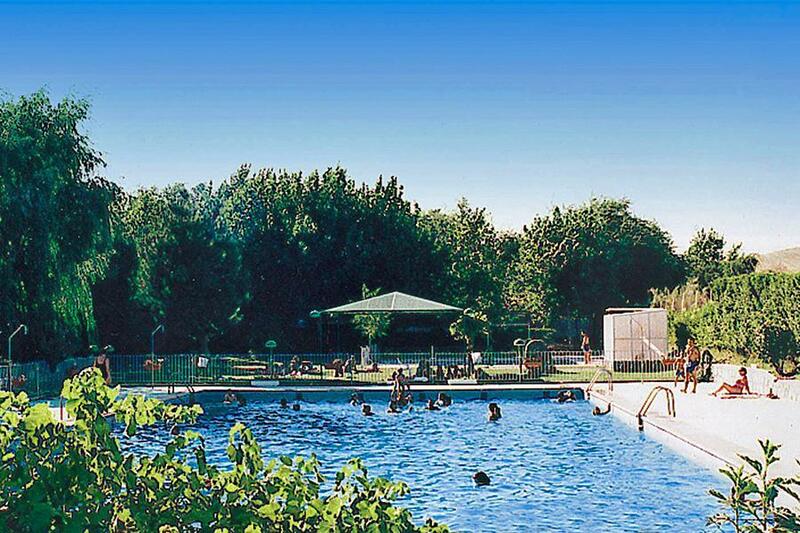 CampingCard ACSI will send your information request to "Campsite Madrid Arco Iris".